We spent Christmas in a locale on many people’s “hope to visit someday” list. Hubby’s family lives in . . . 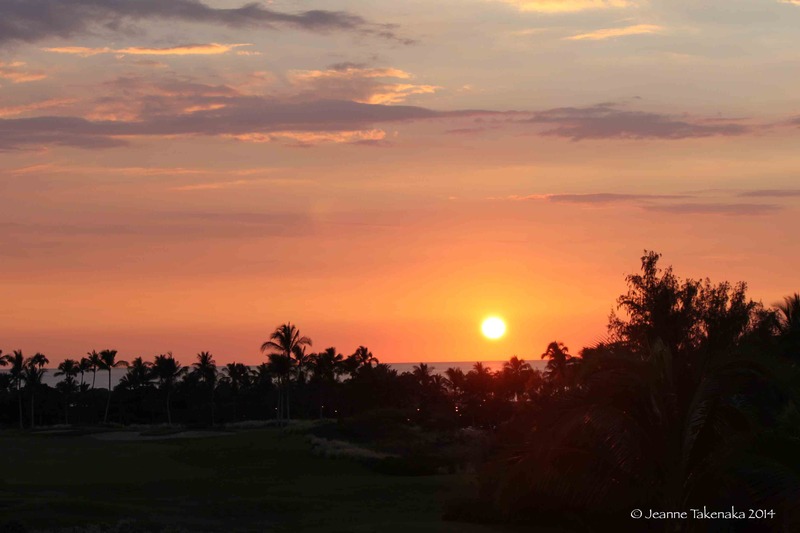 The land of beautiful sunsets, crashing waves, gentle breezes, and . . . frustration. One morning, Hubby and his brothers took all the Takenaka kids to a great beach. I love hanging out with my family, but my heart pitter-pattered at the thought of four hours of “me” time. Work on the story I’m writing. 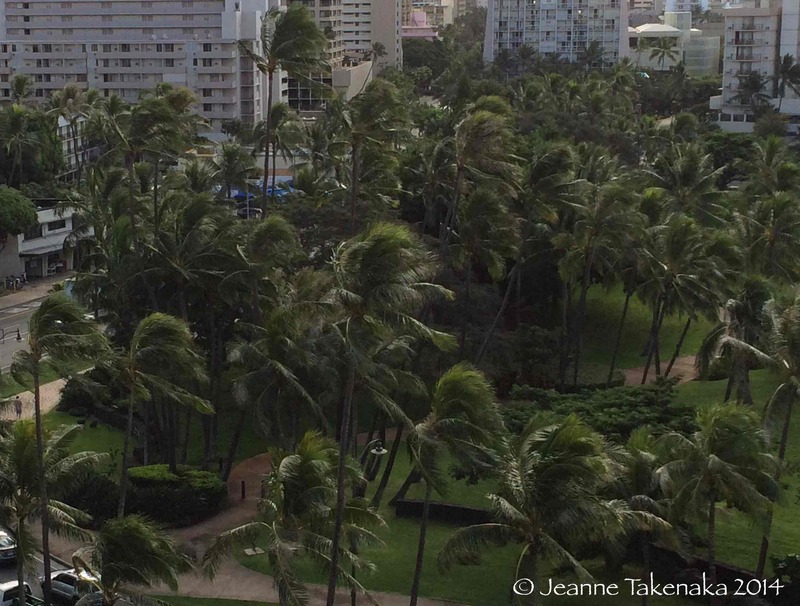 I strolled the sidewalks of Waikiki for forty minutes, searching for a path to the beach. When my injured ankle began to ache, I gave up. Concrete ruled the morning. Disappointed I walked to our hotel. 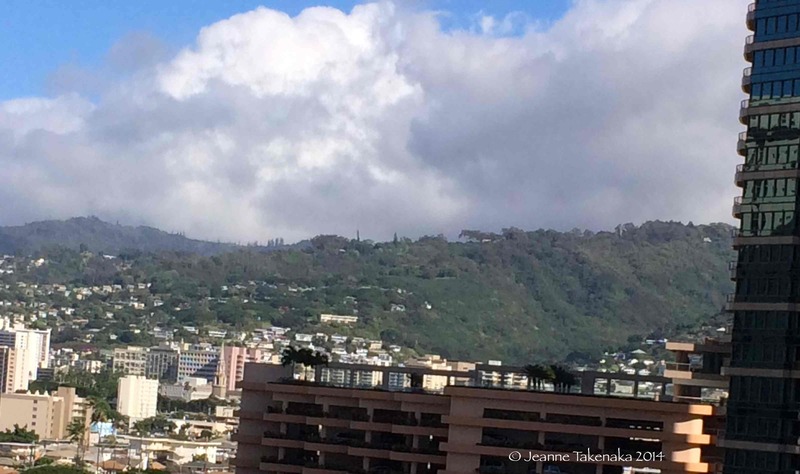 Hotels, old apartment buildings and busy avenues made up the immediate view from our room, but beautiful emerald hills rose beyond Honolulu. On that morning, large puffy clouds crowned them. My heart sighed at the contrast of green with gray/white. I settled into a chair on our lanai (balcony) and prepared to chat with Jesus. As I turned on music to drown out blaring car horns below me, the wind flipped my Bible pages. And rain spattered my arms. Later, I pulled my computer onto my lap and clicked on my story. I couldn’t open it. I searched the internet for solutions and found . . . nothing. Beyond irritated, I shut down. My soul hungered for beauty, but what it nibbled on was the ugliness of frustration. I was still focused on the disappointments when Hubby arrived “home” with two smiling boys. Our nearest outer surroundings mirrored my inner condition. 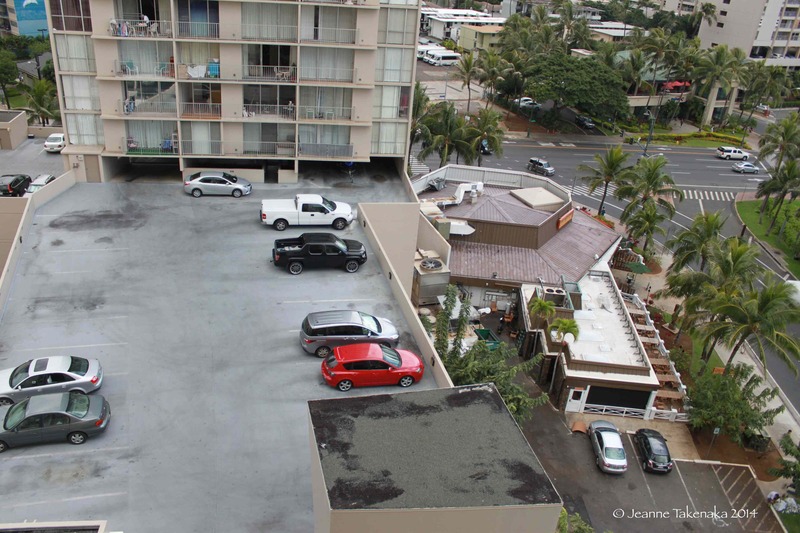 The ugliness just outside our lanai made me sad. The sense of “old” hung from every balcony. 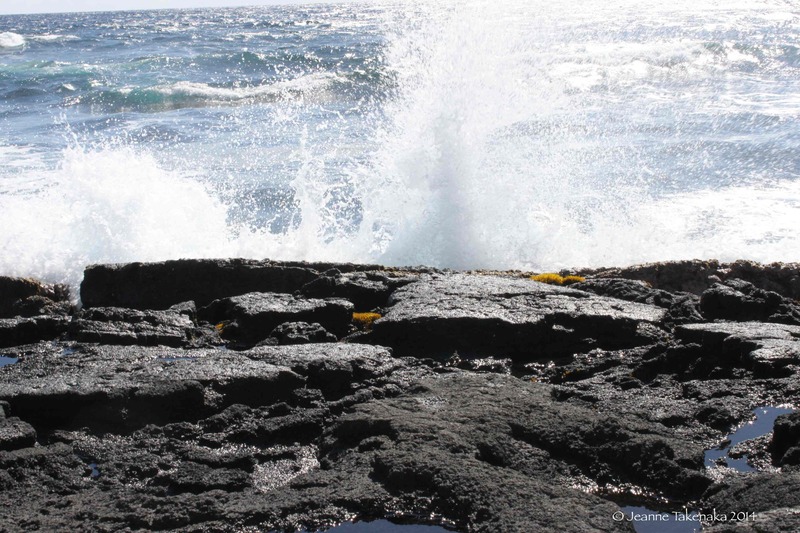 Within me, discouragement and frustration roiled like the waves I’d seen earlier on our trip. Only instead of beauty a storm brewed. How easily I focus on the ugliness that’s front and center, grabbing for my attention . . .
and allow disappointment to rule how I respond to other circumstances in my day, my life. Sometimes, I must choose to look beyond the immediacy of frustration. To focus my eyes, instead, on the beauty in the distance. It’s out there. I can see it if I’ll readjust my focus. Sometimes, I see beauty with my eyes, like the mountains in the distance I glimpsed from that lanai in Waikiki. Sometimes, I have to see beauty with my heart, like when I re-discover hope. Hope that enables me to move forward from where I am to where God wants me to be. No, my situation on that Waikiki morning wasn’t a huge one, but it reminded me I can always choose where I focus my heart. Where I plant my eyes determines how I respond, both internally and toward others. One choice leads to frustration. Another leads to beauty. What about you? How do you find the beauty around you? What helps you work through disappointments? What locale is on your “hope to visit someday” list? The most frustrating thing for me right now is that I can’t flog my body into doing everything I demand of it. The strength and energy are simply not there, and I hate that. There’s a small evil that rides with this, and that’s perfectionism. Lacking the ability to burn the days like I used to, each minute is precious, and if I make a mistake and have to backtrack, the time lost hurts more than it usually would. I try to deal with all this in a calm fashion, without going Tourette’s. Sometimes I succeed. Comparison with things like starvation and genocide help. I really have NO problems. Well, being lethally ill is kind of bad. But it’s still not Rwanda or Sierra Leone. There’s no place I want to go, now. As I write this there are 22 dogs within 20 feet, all asleep. Some snoring, some yipping in their dreams. It’s magic, and they are all individuals…why would I want to spend time away from these most innocent and loyal of God’;s creatures? Andrew, you have a way of honing in on the most important. We do deal with issues, some more serious than others, but here in the US, we see nothing compared to those who are tyrannized and terrorized around the world. I’m sorry the strength and energy aren’t there to do what you want to do, and have been able to do in the past. Adjusting to a new normal sometimes hurts. Perfectionism doesn’t help. 🙂 I deal with that, and the men I live with deal with it. Thanks for stopping by. I always appreciate your comments. I love it when beauty emerges from frustration. It always has God’s hand all over it. Thank you for this reminder. I would love Hawaii someday! or Paris! Lisa, I’m so glad you stopped by! Paris….haven’t been there yet. It would be fun to plan a trip someday. 🙂 Hawaii is beautiful on many levels. God has unique ways of showing us beauty amid frustration, if we’ll stop and look, eh? 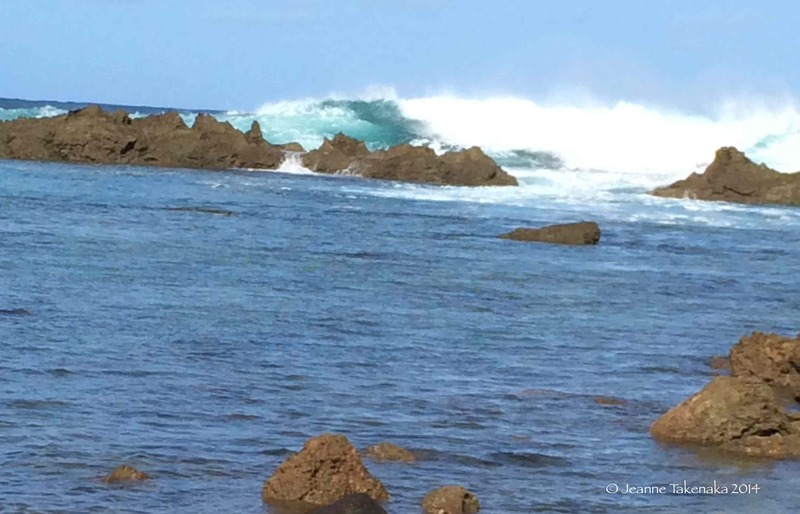 Now why did I know you would have blog posts tinged with glimpses of both Hawaii … and truth? Good words, Jeanne. Isn’t it amazing how easy it is for us to lose perspective even when we’re in a place where many people would love to be? We are blessed to go to Maui every year and when I see people who are angry and unhappy, I think, they must really have problems if they’re not enjoying themselves here! But, it really is more about our heart. Thanks for sharing a remainder of God’s truth. I decided, with God’s help, that a whole year to focus on one word was too much for me, and instead I chose 12 words — one a month — and I’m focusing on Hope for January. If you don’t mind I’d like to use your sentence on Hope. I’ll give you credit — though it’s just a page on my blog, not posts. You made me smile. 🙂 Yes, those pesky expectations rear their heads when I least expect them, or desire them. 🙂 I love your tips for that: think on what I expected and then pray for God to remove it. Wise advice!